Flowers can go a long way when brightening up your home. Floral arrangements can transform any space and they don’t have to be difficult to create. Thanks to our Produce department, you can easily pick up some of this season’s best flowers and create your own flower arrangements for any size vase in a flash. Start by separating the flowers by type, then by size. Separate out filler flowers and foliage in their own section. Make sure all flower stems are in the water. Overlap the stems under water to keep the arrangement in place. When arranging flowers for round vases, start by adding the largest flowers first. In our arrangement, you’ll notice that the flowers have rounded edges, which will give the arrangement a fully rounded shape. Here’s how we put our arrangement together! Using floral tape, create a grid for the flowers. This gives a guide to follow when arranging and helps keep flowers in place. Add foliage to the vase. Top off the arrangement by adding baby’s breath into any open areas of the vase. 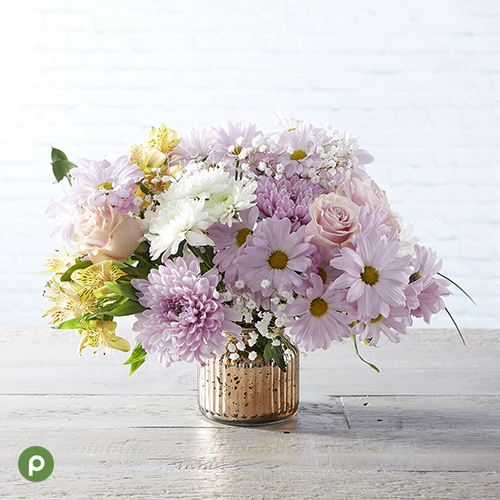 Use your short vase to its full potential by grouping flowers to create small focal points. These focal points will add shape to the smaller vase and make it more visually appealing. Here’s how we put our arrangement together! First, place the foliage to help keep the remaining stems in place. Place the baby’s breath in to help the foliage create a grid for your remaining flowers. In a triangular shape, add in the chrysanthemum at a height a few inches above the vase. To create a better visual, cluster one rose and one pompon and add them to the vase. Cluster one alstroemeria and one pompon and add them in. Repeat the last two steps as necessary until you’ve filled your vase. Get out your ruler because tall vases call for tall flowers at varying heights! When arranging, start by adding your tallest flowers to the vase first and then build around those. Here’s how we put our arrangement together! Place the eryngiums first and cut the stems so the flowers sit right on the top of the vase’s edge. Add in stock flowers and keep their height around 1 ½ times the height of the vase. For instance, if you’re using a 10” vase, these flowers should be 25”. Add mini carnations two to three inches below the top of the flowers. Add your foliage two to three inches below the top of the mini carnations. In the middle of the foliage, add calla lilies. Height-wise, these should reach the middle of the eryngiums. 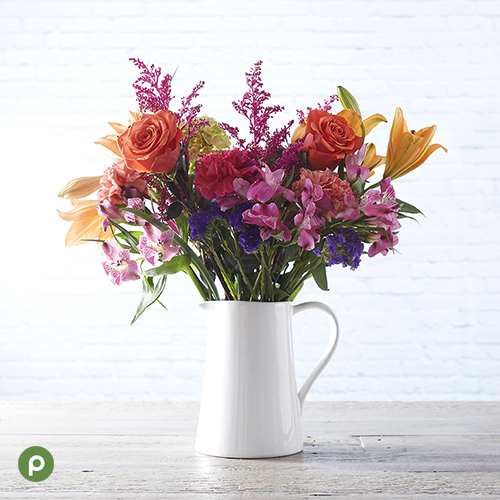 When using a pitcher as a vase, you’re going to want to start your arrangement from the rim of the pitcher and layer up. Here’s how we put our arrangement together! Add in all the foliage in a tall, loose style that’s at least 50 percent higher than the height of the pitcher. Add eryngiums at the same height as the foliage. Add baby’s breath just above the height of the eryngiums and foliage. Add in mini calla lilies, green ball dianthus and green athos at a height just above the baby’s breath. The alstroemeria and solidago should be added at a height just above the mini calla lilies, green ball dianthus and green athos. Complete the arrangement with the tallest flowers. The stock, green micro pompons and the mini carnations should be placed at about the same level at least 1½ time the height of the pitcher. Which arrangement is your favorite? Let us know on Facebook, Twitter and Instagram!